GTA Online Deadline Mode Brings Tron to the Game | Nerd Much? 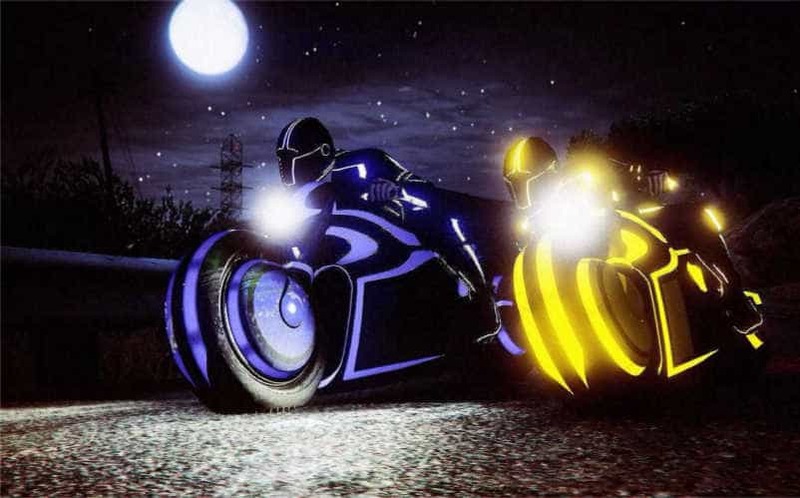 GTA Online Deadline brings Tron to the hit Rockstar game. This new mode comes complete with light cycles, matching outfit, and a deadly light trail. The bikes you will be using are the Nagasaki Shotaro. As you can see, they share a strong resemblance to the bikes that made Tron famous. Just like their look-alikes, they leave behind a neon trail of light that is deadly to cross into. What makes the GTA Online Deadline move better than Tron is the arena design. Rather than something flat and boring, you have a playing field with various obstacles, platforms, and power-ups to affect your match. This really looks like another reason GTA Online is one of this generation’s biggest online experiences. The game keeps adapting and adding more to keep players interested. Even if you’ve wandered away, this is yet another reason to jump back in for a spell. GTA Online Deadline also fits right in with the Biker update a few weeks ago. At least 25% has been taken off the prices of various properties, weapons, and vehicles. Just like every update before it, Deadline is available completely free of charge. With Rockstar incorporating online into Red Dead Redemption 2, we can only dream of similar support.